According to online reports, a cow with two heads was recently spotted in a community in Gombe state. Multiple online users took to social media to reveal their shock following viral pictures of the two-headed cattle.While people are trying to understand how this is possible, report gathered online has it that the location of the weird cow has now turned to a tourist site as residents keep gathering to see the animal for themselves. 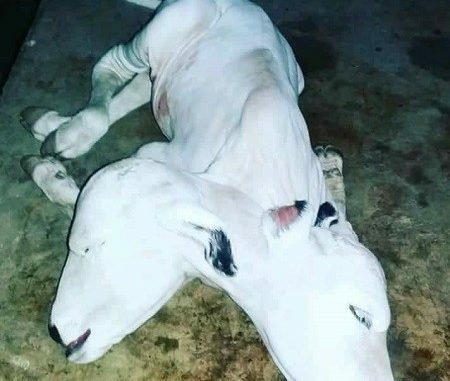 Last year, a two-headed calf was born on a farm in the northern town of Guru, Kebbi state, causing panic among the locals.It remains unclear whether the bizarre creature was stillborn or died shortly after its birth.